I could not answer this question, it would be appreciated if someone could help. Extraction: What is meant by sodium hydroxide as a solvent? What are the two layers? Which one is the aqueous layer? Acid-base chemistry: Are the solutions neutral, acidic, basic, or something else? What form (as is, protonated, deprotonated) will species A-F be converted to in an acidic, neutral or basic solution? 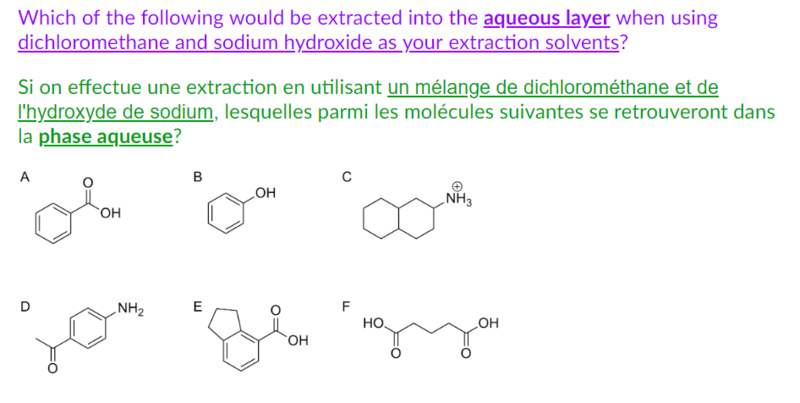 In other words, what acid-base reactions could occur between A-F and the extraction layers? Intermolecular interactions: What intermolecular interactions can species A-F, in their various protonation states, have with the aqueous layer or with the other layer? Once you are comfortable with these concepts and have answered or considered all these questions, you should be able to come to a conclusion. Converting 26.62 NOx µg/L into mM (millimolars)?